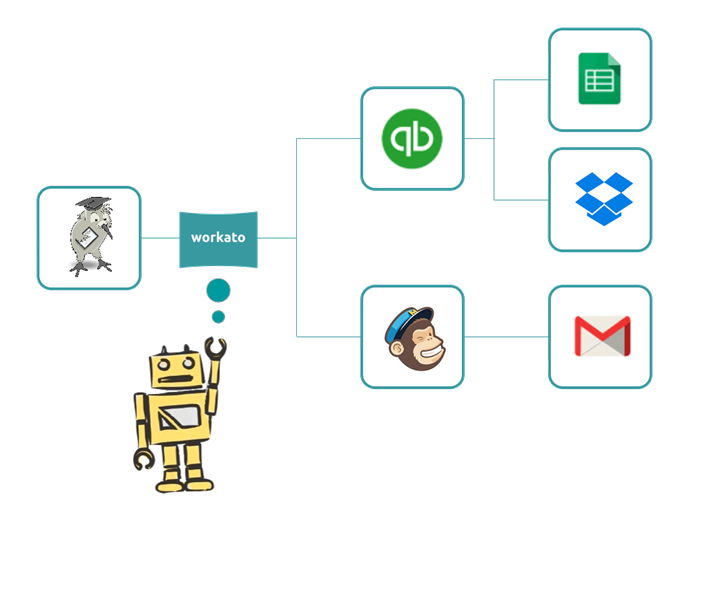 Kiwiversity uses Workato Intelligent Automation to interface and communicate with other software in real time. Up-to-date information about leads, students, payments etc... can be transferred to other apps like Mailchimp or QuickBooks. Integrating your School Management System (SMS) with your accounting application or your marketing software like Mailchimp is a key step to freeing up some precious time. If your SMS and accounting apps can send data back and forth to one another unhindered, manual data entry becomes a thing of the past and that means the hours you used to spend doing it are suddenly open for better things. Double data entry is time wasted: Entering the same data into two different systems is wasted time, whether you are manually typing it or downloading CSV files. Errors and bad data can cost you: Manual data entry is tedious and therefore error prone, especially if you’re entering information twice, discrepancies between your SMS and accounting can cause huge issues that are difficult to fix. Complex systems: Don’t let your student information, tuition history, and marketing efforts work against one another.